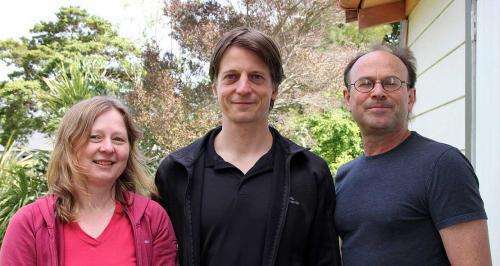 Claudia Voelckel, lead author Matthias Becker and Peter Lockhart – Massey members of the New Zealand team whose work is helping to explain the evolutionary significance of hybridisation in nature. (Phys.org) —Massey University researchers have the first convincing evidence that interbreeding between closely related species (hybridisation) can aid plants during periods of environmental change. The new study shows that plants use hybridisation to alter genes to help them survive predators, pests and pathogens. The New Zealand research, led by Professor Peter Lockhart at Massey University, is featured in the prestigious journal Nature Climate Change. The team focused on the endemic genus Pachycladon, a New Zealand alpine herb and a model group for the study of plant species radiation. Professor Lockhart, of the Institute of Fundamental Sciences, says the research builds on decades of work that suggests rapid diversification and convergent morphological evolution within the New Zealand flora. A key question is whether hybridisation has been important in the evolution of plant species. "Hybridisation was reported as a feature of the New Zealand flora in the 1930s but genetic evidence to establish the extent of its occurrence and significance has been slow to emerge," he says. The team has been focusing on Pachycladon since receiving a Marsden Fund grant in 2005, developing novel analytical methodology and Illumina sequencing protocols that could provide objective evidence for hybridisation. "This paper highlights the role of hybridisation in facilitating the survival of endemic species through periods of environmental change," Professor Lockhart says. "We show that through hybridisation, species of Pachycladon have swapped and genetically altered variants of their pathogen/herbivore defence genes and we think that this process is likely to have helped species survive in a changing environment of predators, pests and pathogens." The results have implications for national and international conservation efforts. "They highlight the need to preserve closely-related endemic species that can hybridise to maximise the genetic potential in ecological restoration projects." Professor Lockhart says they also raise a flag of caution and appreciation of the evolutionary force of hybridisation that can also help invasive species acquire characteristics of endemics species, or properties that assist competition with endemic species, and colonisation of their habitats. The novel methodology developed by the researchers can now be applied to advance studies on the evolutionary ecology and physiology of any group of animals, plants or microbes within the New Zealand biota.